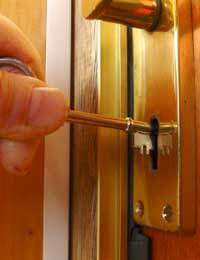 Home > Ask Our Experts > Can I Put A Lock On My Bedroom Door? The first thing your fiancée needs to do is read her tenancy agreement. The terms of her rights and responsibilities to the property are specified in this agreement and may include information about changes to the house and/or fittings and furnishings. If your fiancée rented through an estate agent then it wouldn't hurt to check in with him or her about standard practices as well. However, if your fiancée has signed a tenancy agreement and it is shown that she is unable to make changes without permission then the terms of the agreement, and the landlord’s refusal to allow the bedroom door lock, may well stand. If your fiancée believes that her tenancy agreement does not prohibit the fitting of the lock then she might be able to make the case that her landlord prohibiting such locks is breaching her right to “quiet enjoyment” of the property as she is unable to feel safe and secure in it. She might also want to contact her insurance company to find out if her belongings are covered by a policy if she has no lock on the bedroom door. If they are not, or if she will be charged a higher premium for her contents cover, then she might want to mention this in her argument to the landlord as well. It could be that the landlord does not realise the security concerns of your fiancée or that the landlord is worried about gaining access to the room as well. If your fiancée approaches the landlord with logical arguments and the offer of a copy of the key to the lock then it may be that a compromise is possible. Unfortunately your fiancée and her landlord may not come to an agreement about the bedroom door locks. At this point it may be best for your fiancée to check with her local authority or a solicitor to find out her exact rights on this matter. If your fiancée has not yet signed an agreement then it may be better for her to leave the property and find a new room, particularly given that her landlord does not understand her safety concerns.